Human activities in space leave residual patterns (memory) within both the undifferentiated and differentiated mind of the universe. Those patterns within a historical sight, its surrounding environment, or the people involved that have become crystallized, act as signal generators, which can be charted, tuned into, and tapping these mnemonic signals we can navigate, and interact with the mnemonic field. The signal may be tuned by isolating them, accompanying them with complimentary elements of various forms (light, sound, actions, dreams, and memories) arranged into feedback and induction circuits will induce charge and flow (mnemonic-harmonic resonance) in the mnemonic matrix of the site (terminal A) and human participants (terminal B). This charged current between terminals, either cyclical (feedback circuit) or linear (induction circuit), if strong enough will produce a field portal through which temporal exploration may occur. Portal operation is aligned with the general and specific site orientations, articulation actions, and time sensitive synchronicity. Psychonaut activities are governed by site history, in relation to the topic for temporal exploration, and the experience and receptivity of the psychonaut involved. 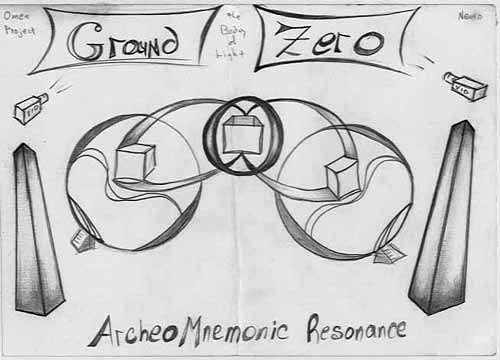 A ‘Mind Tap’ is actuated using a linear circuit drawing from the individual, through the articulation and manipulation of the nexus points of a resonant time circuitry focused on a receptive mind within the mnemonic field core. Where as a ‘Memory Slip,’ may be produced by reversing the flow towards the individual. General Orientation - calendar relation, matrix orientation to North, and environmental conditions. Specific Orientation - artifact memory, historical structures, structural nodes, architecture, remains, archival media, room ‘coloring’ or frequency, and perspective. Carrier Wav, Memory Engine - light & sound pulse generators applied to the architecture and aligned with the room ‘coloring’ and matrix orientation. Articulation Engines - symbols, language, actions, and mobile resonators. Synchronicity force lines, flow channeling as well as the inertia, generation, or transmutation of light, sound, and human activity.